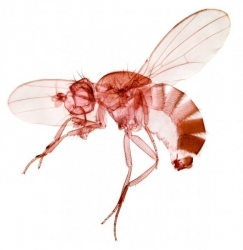 This is a 15-frame microscopy image of a Fruit Fly (Drosophila). Each frame is a 2-exposure focus-stack using Helicon Focus software. Magnification is x50 using a research trinocular microscope and a Canon 5D MkII DSLR. Processing by Noel Carboni in Florida U.S.A.